Founders and Startups, Creative Teams, Sales Teams, Sales Managers, International Sales team and dynamic companies looking for a powerful sales tracking too to fit into their workflow. Convert more leads, close more sales, track your deal flow. Get an instant snapshot of your sales pipeline without spending hours updating deals and attempting to keep up. Increase your interaction with your clients, and turn cold leads into paying customers. 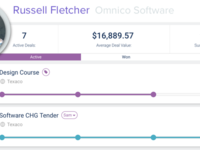 No longer rely on chance or guesswork when it comes to your companys most valuable assets Your sales forecast and revenue stream. Tubular really is simple sales pipeline software, built for teams. Pros: The simplicity of using Tubular is phenomenal, especially for a non-technical person such as me! Plus the ability to be able to neatly track & identify a once chaotic element of our business is truly awesome. The increases in our profitability to speak volumes for Tubular! Overall: As manufacturing is the core of our business we were forever stumbling between firing-out quotations & tenders, as well as hastily fabricating items in our factory, therefore neglecting to manage intelligently the flow of work through our order-book and onto the shop-floor. We often lost projects too; as we failed to recall what we had pitched to who, with culpability frequently slipping between sales personnel and our pricing department. Equally: we became grossly inefficient as a manufacturer, with too much work hitting production all at once, placing expensive demands on our resources to combat this. Tubular has delivered abundant enhancements to both our order-entry & manufacturing-productivity which I cannot overstate. As an MD striving to run a company, the reassurance I take from being able to monitor our sales pipeline and projected monthly invoicing via the touch of my IPad; is the source of both incredible solace and positivity. Recommendations to other buyers: Engage your sales team as early as possible with Task Management, as this soon develops conscientiousness & healthy competition! Thank you for the review. We are so glad that Tubular has been able to help your process so much. You're feedback as a user and from a business perspective of how we can improve the platform has been invaluable . Pros: Tubular for the win! We test drove three small business CRM's simultaneously: Pipedrive, Tubular and Hubspot. I had my assistant set up our account on all three because I was interested to see how easy the user onboarding and adoption would be as we will be hiring more staff soon who may or may not have CRM experience. Cons: There were some integrations that we didn't know Tubular already had and we had to chat with support to find. However, I wouldn't say this is necessarily a con as they were quick to show us where to find them in the settings. Overall: As a small startup team whose growing rapidly we appreciate the value along with the packaged features that Tubular offers. We are looking forward to growing with them! Thanks for the review ! We are loving having Property Protect onboard ! And there are so many new exciting features coming in the next few months. We'll be sure to make our integrations a little easier for people to find in the future too. Pros: I love the clean user interface, the ability to create task templates, and to quickly see our sales pipline with revenue. Cons: I've had some trouble making outgoing emails from the interface, but luckily they have a custom email and code I can drop in the Cc portion from my own email client that auto-imports the communication into a Deal's timeline. So, all good. Overall: Overall, my experience has been fantastic. Customer support, largely, have been over-the-top helpful in answering questions I have had. Further, Rep understands the growing pains we are having and has been ready and willing with suggestions and advice. I'm looking forward to growing with Tubular and I'm excited for some of the new features they have coming. Thanks Tubular! 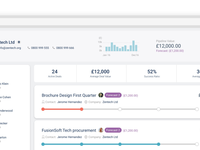 Pros: My favourite feature is the Contacts and organisation page, which although wasn't the reason I signed up to Tubular has ended up being our CRM and company address book. Cons: Previous to last week I noted that the IoS application was not available, but I learnt this week that it is now in the I-Store. Overall: I have searched for a sales management application for quite some time, as I both manage the business and the sales team. I travel often as part of my business which means I have to utilise my phone more than needed. Tubular has cut down our email activity, dropbox activity and has centralised our team which is made up of office workers, and remote workers. Recommendations to other buyers: The simplicity of this software makes it easy to understand for teams. It took me minutes to show people how to use it. Thanks for taking the time to review Tubular. We are so glad you are enjoying using the product. Pros: I have used Tubular for over a year now with every feature improving our company's business development process. Compared to our previous experience with CRM tools, I have really enjoyed the speed of use, overall experience and ability to move the important steps forward in our sales process. Cons: The reporting tool continues to develop and get better, but not every report we need is available just yet. Tubular released two new reports just this week that automated further for us so excited to see this move forward. Pros: Real-time support took days rather than months for staff to understand and get on board. Prevents task duplication inter-company. Cons: None to speak of if I consider the nightmare I had implementing a project management system across the company. Overall: Tubular is a great piece of software and cost effective. We have rolled out Tubular across our R+D and sales department with great success and minimum friction. 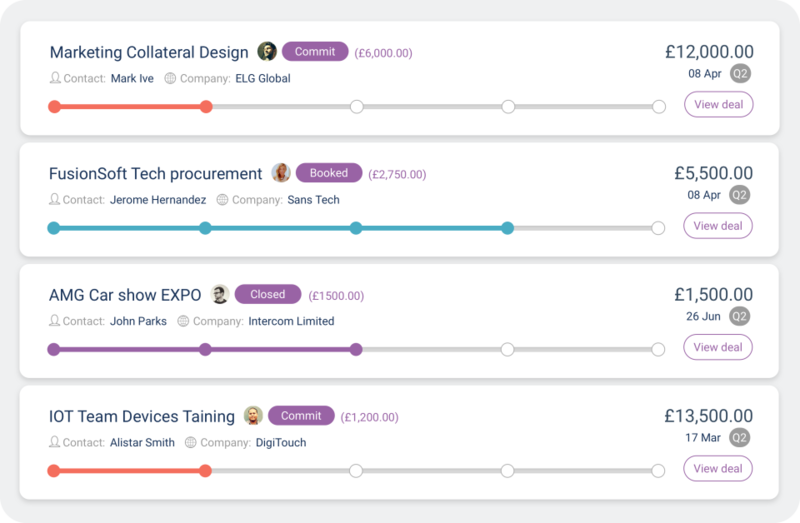 I would recommend Tubular to anyone who wants to create efficiency within their sales teams. Recommendations to other buyers: The developer's response is fantastic with quick updates continually pushed, proving you get more bang for your buck! Pros: We loved the ease of use and the time it saves us having everyone on the same page in real time. No more spreadsheets and meetings to get updates! Overall: Working in property we required software that can handle multiple new business leads at a variety of different stages. Tubular was the best fit for us having searched around. We found that our whole team was able to use the software with absolute ease, keeping all of them up to date with how our leads were progressing so everyone was on the same page. From a management point of view, I could filter down into who is doing what to ensure we don't miss anything and assign new tasks to my team when a new prospect became live. Also, loving the app, being out and about at meetings a lot makes it easy for me to still manage our pipeline. Pros: Visual, intuitive and easy to use. Cons: I found entering all contacts in a bit laborious but they have added new functionality to help with this recently. Overall: I started using Tubular to add more notes to my sales pipeline and be able to share with key people on my team. I find the visual element of this easy to follow - at a glance. The notes and reminders are great too, it can be hard to keep things moving when you are bogged down in client work but Tubular makes this easier for me. Recommendations to other buyers: For the price, I would say invest in this software. It's easy to use and helps to streamline pipleline work. 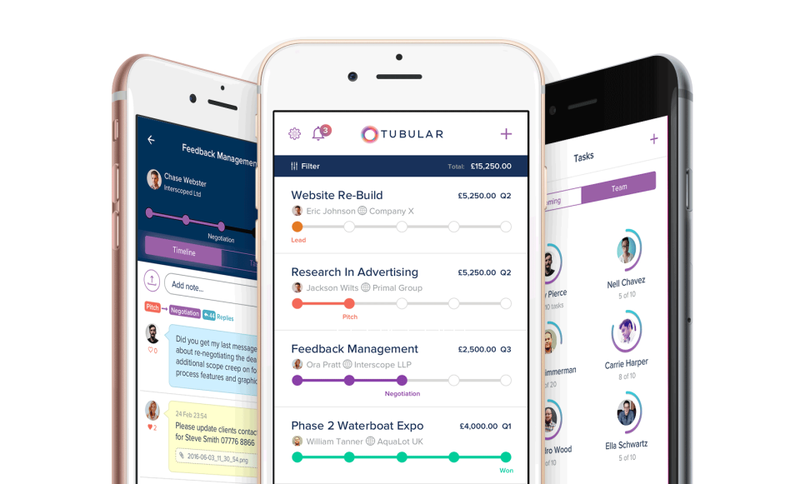 Overall: I spent quite a bit of time evaluating small business CRM platforms, but once I found Tubular, it was an easy choice. The platform is easy to use, and has enough features without being bloated. 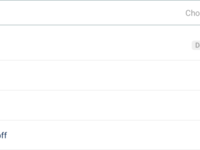 My favorite feature is DNA/lead finder, which autofills contact information and also finds prospect email addresses, and is unheard of at Tubular's price point. The primary reason I chose Tubular was the customer service. The co-founders of the company, are almost always available via instant chat through the app (or on the Tubular website). They are incredibly responsive and helpful, and they take the time to understand individual requirements and objectives. In a space that feels like there are infinite vendors, the two of them provide a personalized customer experience that is unlike any other vendor in the space. Pros: Ease of use. It's so quick, even our busiest sales guys can just pop an update, and we can properly analyse performance. But perhaps even more impressive is that on multiple occasions, Tubular guys took the time to listen to feedback directly, and implement changes as we needed them. Very adaptive, very easy to use, and great value at such a low cost. Overall: Our sales team just didn't update other CRMs we used. This made tracking deals impossible, and their productivity decreased. With Tubular, because it's only a few seconds to do something, and so nicely organised, we are always up to date, and productivity has never been better. It's hard to put disliked things of Tubular. This is because yes, sometimes things may not work at first, but the support team sorts everything out so fast, you just can't stay mad at them. Tubular Data is the best Data! Pros: The data doesn't compare to other platforms out there. Cons: Can't really say anything negative they are the top in the industry. Overall: To really understand the performance of a video starts with Tubular..in order to grow your business you have to understand your audience and Tubular gives you all the tools to do that which is invaluable in today's digital world. A great piece of software. Affordable and easy to use. A good ROI for our startup. Pros: Managing our contacts and potential sales was proving difficult and time consuming before. 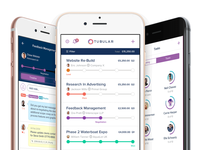 But, we've recently started using Tubular and its really helped us The thing I like about Tubular is, it takes such little time to update my deals, tasks and leads. Now I have an up-to-date sales platform and I get to do all my normal operational jobs as CEO. Cons: As a relatively new piece of software there are updates made from time to time which means minor points of learning from time to time - but the updates/changes are always improvements which I commend. Pros: Tubular's easy to use design works really great for a start up like ours. Adding leads and updating the sales stages is a breeze. The bcc email function works great too. And as any inside sales person can attest, if this process takes a lot of time...I probably won't use it long term. Cons: I wish Tubular would add a way to segment B2B vs B2C customers beyond tagging but hopefully they will in the future. Overall: Our team tried several platforms before signing on with Tubular and happy to have found them. Filtering through Deals is the most useful thing in the app. Overall: Tubular is a great fit for our sales team, it has most of the features that we need. Prior to Tubular we used online spreadsheet to manage our deals which became troubling when our sales team stared growing. Fantastic - great onboarding. The interface and functionality itself really work for our agency. Pros: As an agency, our staff just won't use software if it isn't easy to use and pleasant to look at. Tubular does both of these things. The features that are built in really make the data used for planning and I love the 'DNA' feature to reduce some of the manual inputs. A really intelligent solution! Cons: Some of the features are buried a bit. Really, not a con because it provides a very clean, intuitive interface. I would highly recommend the demo to take full advantage of all of its offerings. Pros: The simple, visual representation of the pipeline coupled with the fact that the deal stage is decoupled from the probability are key. This may sound minor, but for me it is absolutely crucial. I also love the weighted funnel. Cons: There are a couple of features I could benefit from that it doesn't have - but these are minor and the constraints mean I spend less time messing around in the software and more time on the pipeline. One of the best designed CRMs on the market. Cons: - Round robin feature would be great for some users. - Zapier integration could been more feature rich. Overall: Helped our clients sales team grow rapidly and convert better with a great system. We are working harder than ever on new features and to keep all our users really excited about what's in our pipeline. tasks. App for smartphone helps me with managing my work outside of office. Overall: Very easy product to use. That's what i like most about it. It's simple so you'll get with it very quickly. Thanks for the Review ! We hope when we add the features in the coming weeks you'll update that 4 to 5 stars. Pros: Makes everything really easy to track and it's straight forward to update. Really easy to manage alongside any internal systems. Cons: Having to open a web browser to use. But the team have informed me on how to download an app so I will be doing that ASAP. Overall: Excellent application, easy to use and very good design. Add contacts and organization is simple and very useful in the application. Deals are the most useful thing in the app, and a lot of help in the business. Pros: I like how intuitive it is. Sales pipeline feature is great, it fits our business model just right. The way we collaborate within deal scope and outside has greatly improved our sales in the last few months. It is a lot easier and much faster to close deals, which is great for our clients as well. Cons: I am satisfied overall but only thing I would like to see added is some kind of notification system. Overall: I've been using Tubular for a few months now and I feel like we have increased our productivity by ten folds. Collaboration is now way easier and I can't be more satisfied. Comments: I've used a different software most of my career the problem is we have employees spending 20-30% of their time just setting, booking, and scheduling deals in it. Tubular is a dream compared to it, hop in update the status of your deal, but in an intuitive easy to use program that allows everyone on the team from the new sales guy to the CEO to see the status of your deals. Fast, beautifully designed, and a great team to work with! Comments: Once I got my deal flow on there I found myself looking forward moving things along the pipeline. This is down to the colorful design and ease of use and is why this has become my go to place for managing any and all deal flow. Thanks for the feedback, we are really please to hear that you're not only enjoying using the platform but it's fun too ! 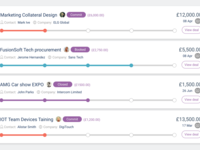 Pros: Tubular was BUILT for creatives to help forecast revenue and manage leads. The interface is gorgeous, tons of options, but it also keeps things simple and easy to navigate and customize. The customer support is quick, responsive and incredibly helpful. Plus the price point is great. Cons: No email integration (yet). I think they are thinking about implementing this at some point. This would be helpful to keep track of email conversations. From the moment we signed up for Tubular and started using it, it became second nature. Pros: The slick user interface is so refreshing compared to everything else out there - it does so much but doesn't feel like a chore to learn. Cons: We feel the search could be improved as it doesn't find some projects based on titles and we would like to update the state of the deals from the ios app. Overall: One place to see where all our projects are and a comprehensive client management tool on top! Sales software that doesn't break the bank. Overall: Discovered Tubular after being fed up with salesforce and adamant that there was a more affordable solution out there. I was pleasantly surprised when I discovered that the user experience was 10x better than that of previous platforms I had used. Great tool for managing sales. Comments: Excellent visualisation tool for deal tracking, very easy to use. Highly recommend for anyone who thinks sales pipeline is a mess ! Think again and use Tubular. Overall: Simple and to the point! I tested many CRM, but found 100% usability of this app. Designing part is perfect, thanks to designers for online version. Mobile apps are really useful and easy to use, great functionality and design. Hi Drago, Thanks for your review. You've been an awesome customer so far with some great feedback. Long may it continue! Comments: It is such an intuitive system, give the team full visibility of the sales pipeline, and once you start creating deals, it becomes so addictive!